James Donavan is nobody special. He works as a computer tech in Champaign, Illinois. He spends his nights watching cable television news into the late hours. He watches and passively observes events of the day. Then the day comes when the turmoil inflicting the United States bursts into the open and a series of deadly terrorist attacks leave the country reeling. James witnesses his whole life become unraveled. The country trembles and threatens to collapse. He can no longer sit back and watch. 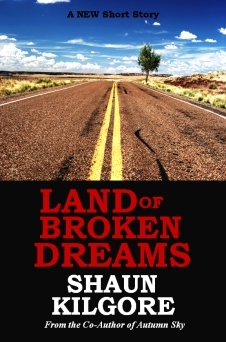 “Land of Broken Dreams” by Shaun Kilgore is free on this website for one week only. This story is also available in eBook form here.